1) Saina Nehwal and Kidambi Srikanth won China open Badminton singles: Kidambi Srikanth beat home favourite Lin Dan of China to record the biggest win in his career and win the prestigious China Open Super Series men's singles title. Olympic bronze-medalist Saina defeated Akane Yamaguchi of Japan in the women’s singles final. In her sixth appearance in the prestigious tournament, World No. 5 Saina prevailed over the 17-year-old Akane 21-12, 22-20 in the women's singles final. This was the first time that any Indian male shuttler has won a Super Series Premier event since the Super Series and Premier tournaments were introduced. 2) Two states, three UTs achieve 100% inclusion in Jan Dhan: In a major boost to the government’s efforts at financial inclusion, Goa, Kerala, Chandigarh, Puducherry and Lakshadweep have become the first states in the country to boast of at least one bank account for every household. “States of Kerala and Goa, union territories of Chandigarh, Puducherry and Lakshadweep and three districts of Gujarat — Porbandar, Mehasana, Gandhinagar have been declared as 100 per cent saturated in terms of coverage of all households with at least one bank account,” the finance ministry said in a statement. 3) International Day for Tolerance & World Day of Remembrance for Road Traffic Victims observed: In 1996, the UN General Assembly invited the UN Member States to observe the International Day for Tolerance on 16 November, with activities directed towards both educational establishments and the wider public. Another international day namely "World Day of Remembrance for Road Traffic Victims" also fell on November 16 this year. Theme for 2014: "Speed Kills - Design Out Speeding" Let’s make 2011-2020 a decade to remember. 4) India whitewash ODI series against Sri Lanka: Skipper Virat Kohli led from the front with a gritty unbeaten century as a dominant India completed a resounding 5-0 whitewash over Sri Lanka by winning the fifth and final One-day International by three wickets in Ranchi on Sunday. Opting to bat, Sri Lanka rode on their skipper Angelo Mathews' unbeaten 116-ball 139 to put up a challenging 286 for eight at the JSCA International Stadium Complex, before Kohli (139) guided India home with eight balls to spare. Virat Kohli has been named the Man of the Series. 5) China to host G20 summit in 2016: Asian powerhouse China will host world leaders for the G20 summit in 2016, Australian Prime Minister Tony Abbott said at the conclusion of two days of talks in Brisbane. Turkey takes over the presidency from Australia and will host the event in Antalya next year, but in a communique the group of the world's biggest economies said China would be home to the G20 in 2016. 6) PM Modi unveils Mahatma Gandhi's statue in Brisbane: Exhorting the world to heed Mahatma Gandhi's advice to tackle terrorism and global warming, Prime Minister Narendra Modi on Sunday said Mahatma's teachings of non-violence and love are as relevant in our times as it was during his lifetime. 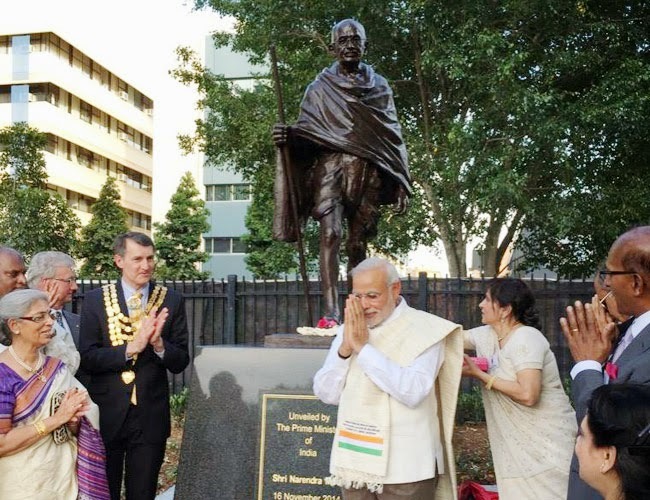 "I firmly believe that Mahatma Gandhi is as relevant today as he was during his time," Modi said while unveiling a bronze 2.5-metre long statue of Gandhi at Roma Street Parkland in this city in Australia's southeastern state of Queensland. 7) National Press Day observed: National Press Day was celebrated across the country on 16 November. The day is symbolic of a free and responsible press in India. It is the day on which the Press Council of India started functioning as a moral watchdog to ensure that not only the press maintains the high standards expected from this powerful medium but also that it was not fettered by the influence or threats of any extraneous factors. The Press Council of India was first constituted on 4 July 1966 as an autonomous, statutory, quasi-judicial body, and it started functioning from 16 November 1966 with Justice J R Mudholkar, then a Judge of the Supreme Court, as Chairman. 8) Sachin Tendulkar adopted Andhra Pradesh village: Adopting a village in Andhra Pradesh's Nellore district, batting legend Sachin Tendulkar on 16 November 2014 exhorted the people to give equal importance to boys and girls and make them educated as he advised the men to shun alcohol and tobacco consumption. "This is a model village which we are trying to create and it should set an example for the rest of the country... This is just the beginning," the Rajya Sabha member said in Puttamrajuvari Kandrika village, which he adopted under the 'Sansad Adarsh Gram Yojana' programme. 9) Raghuram Rajan on shortlist for BRICS bank chief post: Reserve Bank Governor Raghuram Rajan, a Union Cabinet Minister and a well-known banker in infrastructure finance have figured so far in discussions on possible candidates for BRICS’ New Development Bank president. This short list is not final; the Modi government is scouting for more names before it takes a decision on the nomination, a Finance Ministry source said.